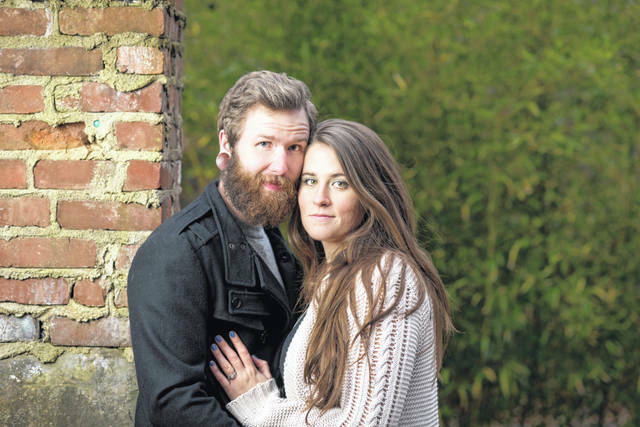 Local couple Marshall Lane and Taylor Johnson will be married at Gather in downtown Delaware on Friday. The wedding, which will be officiated by Mayor Carolyn Kay Riggle, is part of Main Street Delaware’s monthly First Friday celebration. For every individual, and every couple, the four-letter word might mean something different. Whatever that may be, each person’s definition of the word is uniquely sculpted by the stories and circumstances that led them to their soulmate. On Friday, Feb. 1, the city of Delaware is encouraged to come out and celebrate the union — old and new — of those soulmates at Main Street Delaware’s “Love is in the Air” First Friday event. From 6-9 p.m., a “walking wedding expo” will be held by participating merchants. Anyone who is currently, or will soon be planning a wedding, can pick up ideas from local shops. From 7-9 p.m. at Gather, 53 N. Sandusky St. in downtown Delaware, Perrywinkle Photography will be taking photos for couples. Photos will be $10 and will be emailed after the event. There will be no planning necessary for one local couple, who was chosen by Main Street Delaware to wed in front of their fellow Delawareans as part of the event. Marshall Lane and Taylor Johnson will be married at 6:30 p.m. inside Gather. The couple was selected via a post on Main Street Delaware’s Facebook page, which asked residents interested in being married at the First Friday event to share their love stories. Lane and Johnson’s story is rich in Delaware influence, with so many milestone moments in their relationship coming in spots around Delaware. “To us, Delaware is a city of ‘firsts,’ and we hope it will be where we get to spend our first moments together as husband and wife,” Johnson said in the Facebook post. The soon-to-be Mr. and Mrs. Lane will receive a host of accommodations for their special day, courtesy of Main Street Delaware and local merchants, which include the venue, tux, wedding cake, flower arrangements, hair, and makeup, among other things. Mayor Carolyn Kay Riggle will be officiating the ceremony, and all of Delaware is invited to attend. Johnson said she and Lane, who got engaged in July, were originally looking at a June wedding, but as the planning process wore on — and frustrations mounted — the two were more than happy to relinquish the stress and allow their wedding to be planned for them. At 7:30 p.m., following the wedding, there will be a joint renewal of vows at Gather for any couple who would like to reaffirm their love. Riggle will lead the renewal ceremony. Carriage rides will also be offered throughout the night. Rides are $15 per couple and will begin and end in front of The Strand Theatre, 28 E. Winter St.
For more information on Friday’s events, or to stay current on what’s to come from Main Street Delaware, visit its website at www.mainstreetdelaware.com.